The Alltech FEI World Equestrian Games will have over 60 different countries represented and one of those is Portugal. 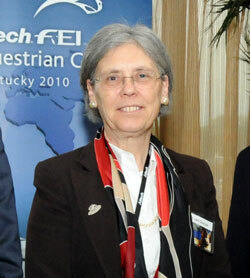 I met Ingrid Van Dorpe, Premix, during last week’s Alltech Symposium. Her company is one of the global partners in the games. I asked Ingrid what she thought of this year’s Symposium first and she says it provides her with a glimpse of the future of animal nutrition. She takes home not only nutrition information but also other business information like branding and she feels more energized. Turning to the Games she says she expects to receive some good promotion for her business while bringing more attention internationally to the value and benefits of good nutrition for their animals. You can listen to my interview with Ingrid below.